The war that has ravaged Syria over the last half-decade is coming to an end. The caliphate declared by Abu Bakr al-Baghdadi of the Islamic State organization on June 29, 2014, at the al-Nuri mosque in Mosul now consists of a few ravaged square meters in Baghouz, in Syria's Lower Euphrates River Valley, that are on the verge of falling to Kurdish forces. The mainly Sunni Arab rebellion against the Bashar al-Assad regime, meanwhile, is already over. What remains of it is now the military component of a Turkish project to turn a corner of northwest Syria into a Turkish client entity. Further north, in the former Kurdish canton of Afrin, the Turks and their allies are facing an emergent, though underreported, insurgency supported by the Kurdish People's Protection Units, known as the YPG. A recent report by Bellingcat, quoted in an article by Amberin Zaman in al-Monitor, noted 220 attacks carried out in the Afrin area against Turkish and allied forces between late March 2018 and the end of January, in the form of roadside ambushes, improvised explosive devices, and executions of so-called collaborators. Around 100 people have been killed over the last month, according to the Bellingcat report. 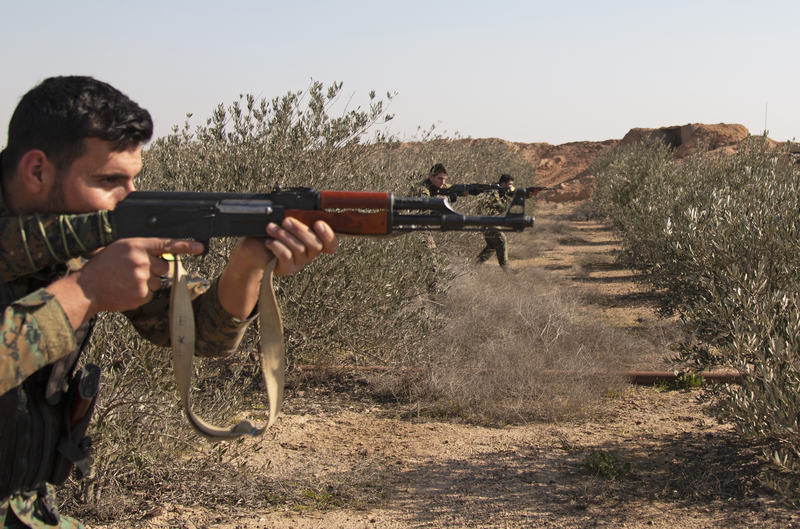 The attacks began in January 2018, immediately after Turkey's arrival in the region as part of Operation Olive Branch, which destroyed the Syrian Kurds' westernmost autonomous canton. A campaign of expulsion of Kurds followed. The Kurdish YPG does not take responsibility for the present attacks. The YPG's sister movement in Turkey, the Kurdistan Workers' Party or PKK, has a practice, however, of using the names of front groups when engaging in some of its less photo-friendly activities; it is probable that the YPG is doing the same. The U.S. and SDF-controlled area east of the Euphrates is also witnessing the stirrings of internal insurgency directed from outside. According to the Syrian Observatory for Human Rights, "236 fighters [of the SDF), civilians, oil workers, and officials" have been killed since August 2018 in incidents unrelated to the frontline conflict against the Islamic State. The killings have taken place across the four provinces of Raqqa, Aleppo, Hasakah, and Deir Ezzor, which are controlled in full or in part by U.S.-allied Kurds. The most recent actions, according to the observatory, were the assassination earlier this month of an SDF fighter in the Swidan Jazira area in the eastern countryside of Deir Ezzor, and the explosion of an IED in the Jammah area of the same province. The area controlled by the regime is by far the most secure of Syria's three separate regions. President Bashar al-Assad has embarked on a slow road to regaining legitimacy in the eyes of most Syrians and faces no major threat to his continued rule over most of Syria's land. But in the regime-controlled areas, too, there are rumblings of discontent. A chaotic array of forces hold power and influence in this zone. These include Iran-aligned local and foreign militias, Russian military police, Lebanese Hezbollah, and, of course, various competing security structures of the Syrian state. These forces have cooperated on behalf of keeping Assad in power, but their interests are not otherwise entirely aligned. As the Islamic State's caliphate disappears from Syria's map, the country is settling into a twilight reality of de facto division, in which a variety of low-burning insurgencies continue to claim lives. Open warfare in Syria is largely over. Peace, however, will remain a distant hope.